Major construction that begins this weekend at the King Street Metro station has Alexandria warning riders to avoid being dropped off or picked up at the station in a car for the next two years. WASHINGTON — Major construction that begins this weekend at the King Street Metro station has Alexandria warning riders to avoid being dropped off or picked up at the station in a car for the next two years. The construction will not impact train service at the station, but will have significant impacts on riders who get on or off there. Beginning Sunday, the entire bus loop, parking and kiss and ride area outside the station will be closed. Parking will not be coming back. A rebuilt, expanded bus loop is expected to open in about a year and a half, with a new kiss and ride drop-off loop, and shuttle and taxi area expected to open at the end of the project. “While the project will bring many benefits to transit users, there will be significant construction impacts through late 2020,” Alexandria’s DASH bus service warned riders in an email. The city suggests anyone driving to King Street instead pick up or drop off at Braddock Road or Eisenhower Avenue stations during construction, since there will be no real space available to pull over and drop someone off or pick them up. Drop offs at the Amtrak and VRE station, or Masonic Memorial entrance, may be an option — if riders then walk under the tracks to reach the station. But, realistically many people will likely drop off and pick up on the street anyway. Private shuttles have been directed to a different station, too. 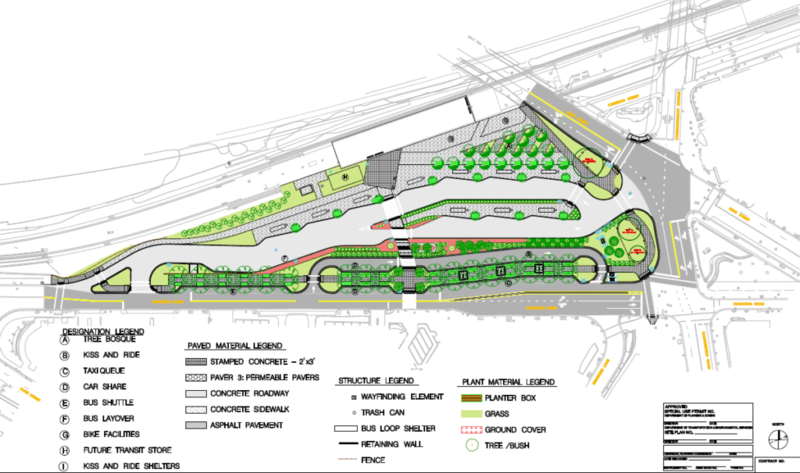 The project is meant to make it nicer and safer to walk in and out of the station, expand the number of bus bays, improve traffic flow, add new bike parking, shuttle areas and car-share spots, and improve lighting and landscaping. While this work does not impact rail service, separate Metro track work will reduce service at specific times, including Nov. 26 to Dec. 9 when there will be no Yellow Line train service, and next summer when the station and all others south of Reagan National Airport are due to be closed for months. That closure will put an additional strain on the temporary bus bays at the station, with rail shuttle buses in addition to regular Metrobus, DASH and King Street Trolley service. There could be extra regular bus service, too, and possibly some additional VRE service. Most of the temporary bus bays during construction are set up on Diagonal Road, just across the current kiss and ride lot from the south entrance to the Metro station. A path through the construction zone will remain open to walk to the south entrance. Two of the temporary bus stops are set up along King Street next to the park area, two are on Daingerfield Road, and one is set up at the north end of the station on Cameron Street. The additional walk-around construction areas could add time to trips, especially if riders just miss a connecting train or bus. 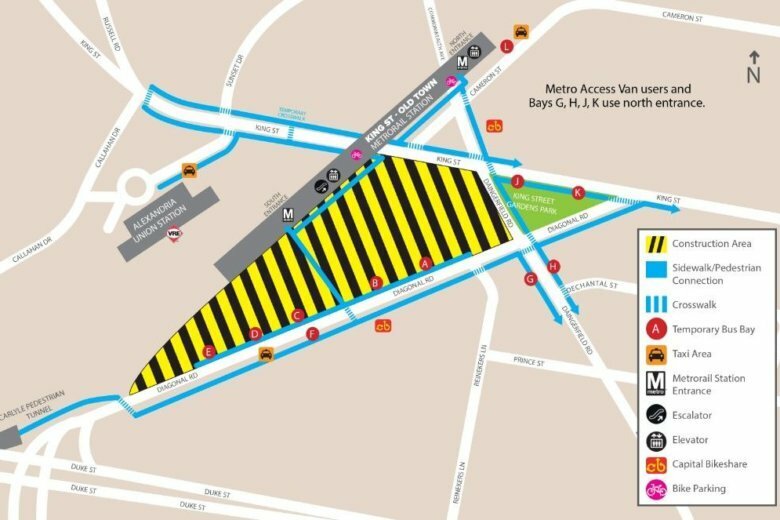 Metrobuses will use temporary stops close to the south entrance to the Metro station; King Street Trolley and MetroAccess pickups and drop offs will be close to the North entrance. DASH bus routes are split between the two ends. 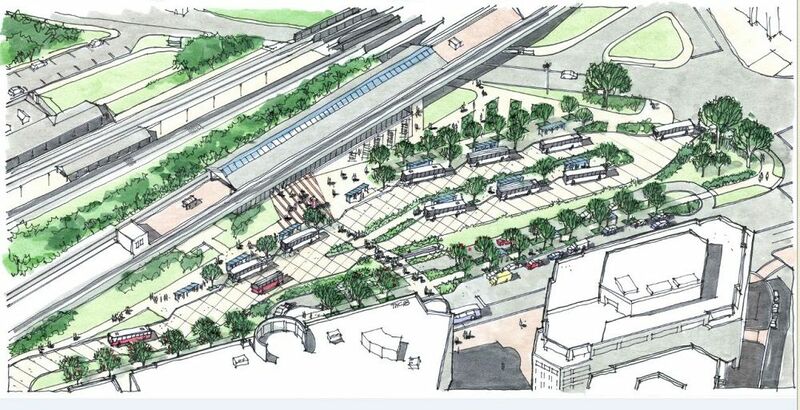 Taxis will be permitted to use Diagonal Road space near the north end of the station, or the area in front of Alexandria’s Union Station, where Amtrak and VRE pick up passengers. Traffic on Diagonal Road between Duke and King streets is expected to be extremely slow, especially at rush hour. Anyone walking to or from the station through the Carlyle Pedestrian Tunnel near the south end will need to cross Diagonal Road twice — once near the bike share docks, then back near Duke Street. The two bike share stations near the station will remain open, as will bike parking at the station. This project was first seriously studied in 2006, which led to a 2008 design that had to be completely overhauled after public complaints. A new concept unveiled in 2010 became the plan approved by the Alexandria City Council in 2012. That is the framework of what is now being constructed. The major construction was supposed to start Sept. 9, but that work was delayed two months. Initial work to set up the interim bus bays on the street that will be used during the work has already led to some less significant closures. Several other new construction projects are also leading to months-long changes at other Metro stations. The entrance to Judiciary Square closest to the National Building Museum closes Nov. 19 for a long-term escalator replacement. The other entrance, where a similar project was just done, will remain open. At Congress Heights, the south side entrance is closed for escalator work. At U Street, escalators on the 10th Street side are closed for a little while longer. At Arlington Cemetery, the north entrance is closed for escalator replacement. At Largo Town Center, a 2.5-year construction project begins Nov. 19 in the station’s garages. First, up to 250 spaces in the North Garage will be closed each day for 13 months. Then, 250 spaces will be closed each day in the South Garage for 17 months. Metro suggests Addison Road or Landover parking instead, each of which typically have many empty spaces. Largo has 2,200 all-day spaces in all. At Vienna, a 1.5-year project began this week in the North Garage that will close up to 450 spaces each day. Metro suggests using Dunn Loring or West Falls Church instead. Vienna has more than 5,100 parking spaces in total. West Falls Church and Dunn Loring each typically have a significant number of spaces available. At College Park, ongoing garage construction has closed up to 325 parking spaces each day. If needed, alternatives until the project is done next fall include Greenbelt and Prince George’s Plaza.